2010 - The Year of Listening? 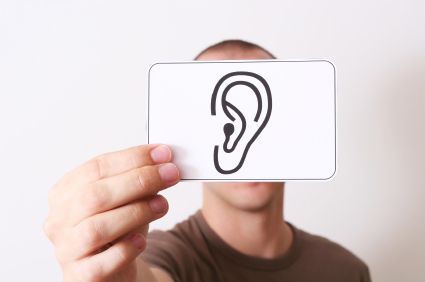 2010 – The Year of Listening? We are almost ready to sign off on 2009, and wow – what a year! I’ve read many excellent posts that discuss predictions for 2010, and there are definitely a lot of great ideas being discussed on this topic. The year of mobile, the year of mass adoption of social media, the year of geo-targeting, etc. These are all exciting, and I can’t wait to see where it all leads. But for now, I wanted to highlight 1 thing that I believe is the most critical aspect for all organizations to embrace in 2010. Listening. We hear about listening and its importance in social media, and I believe that organizations that are still struggling to make sense out of the social media space (or indeed the entirety of the changing media landscape) would be doing themselves the biggest favor by simply making a concerted effort to listen. Powerful things happen when we listen, but perhaps more importantly it’s the thing that happens after we listen that matters most. Thinking about what we’ve heard is critical before just jumping in and starting to talk back. This concept plays out in personal dialogue all the time, and most of us can be better listeners, myself certainly included. Think about how you interact with other people either face to face or over the phone – do you listen to what the other person is saying to you and take the time to process their thoughts before articulating your response, or do you jump right in as soon as there is a pause? Worse yet, do you interrupt people as they are speaking and try to finish their sentences or interject your thought before you forget it? We’ve all been there, on both sides of that situation and it’s a bad habit that inhibits our relationships with others. The same holds true for business. If we are constantly interrupting without processing what the community is telling us, then we are not really present in the conversation. The value in truly listening is incalculable. Everything we need to figure out what to do next is all there, we just have to be open to discovering it and we have to take the time to process the information and think, not react. Everyone approaches this in a different way, but I think a critical factor is that we give ourselves permission to think. Take time. Turn off your email. Turn off TweetDeck, Seesmic, HootSuite, or whatever monitoring tool you use. Take a walk. Meditate. Go for a run. Do whatever it is that you have to do to get your head around the information. Then come back and discuss your ideas with your team. You’ll have lots of great data and insights to back you up, which will help you build your case. Does this make sense? So many people in Marketing are trying to figure out what to do in social media in 2010, or how they can get their bosses to buy into it/assign budgets, etc. If you are in that situation and you need to convince your company to engage, I think the single most effective thing you can do is to get them to listen to what is happening in your community or industry without committing to any particular course of action. Propose that they sign up for a Radian6 account, or whatever monitoring tool you prefer. Don’t worry about what you are going to do next – that’s what the thinking stage is for. Just listen. Take time. Maybe it’s days, weeks, a month or more. The point is that by listening and capturing information and then taking the time to think about what you’ve heard without pressuring yourself or your organization to have the answers immediately, you will be in a much better position to engage your boss, your staff, your customers, etc. in a way that will resonate and provide value to everyone involved. What do you think? Can 2010 be the year of listening?